There are many restorative methods out there, but only one method has proven time and time again to be the most effective at giving patients the life they’ve always dreamed. Dental implants in Norwood have many benefits, both aesthetic and functional that can improve your quality of life. If you’ve been considering treatment that restores your smile and lets you do what you want without hesitation, dental implants have shown a lot of promise, according to your family dentist. Dental implants are screws made from titanium that are surgically inserted into the jawbone. Here, they provide support for a crown, which is placed on top. Typically, implants are meant to replace natural teeth that have fallen out over time or as a result from an accident. When your dentist determines you’re eligible for dental implants, you’ll find there are many benefits over traditional restorative methods like dentures. When your face lacks teeth, it’s more susceptible to sagging and sinking, giving you a sad demeanor. Fortunately, dental implants allow your face to retain its natural shape and smile. Since implants are fully integrated into your bone, they can provide this additional stimulation, where dentures only rest on top of your jawbone. You’ll also find eating to be much easier with dental implants. Dentures prevent you from experiencing the full taste food provides, plus they can slip out while you do it. Furthermore, dental implants can’t get cavities since they are made of inorganic material. This means bacteria can’t feed off the ceramic crown that covers your implant. If you know anyone with dental implants, they’re likely to agree. 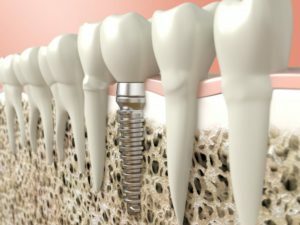 How Do Others Feel About Their Dental Implants? According to Dr. Jocelyne S. Feine, a professor of dentistry at McGill University in Montreal, CA, people are ecstatic after receiving their new dental implants. Based on reviews from her patients, their reactions are phenomenal; they eat better, seem healthier, and enjoy life more than those without dentures. “It makes such a difference in their lives” she told the Hartford Courant, a newspaper based in Connecticut. After implant surgery is completed, patients are usually given pain medications as well as antibiotics if needed to aid in their recovery. To find out if dental implants are right for you, talk with your family dentist in Norwood today to schedule a consultation. After completing his undergrad schooling at Boston College, Dr. John T. Michaels, D.D.S., pursued his dental degree from Ohio State University Dental School. He enjoyed his time so much in Boston that he returned there to start his practice in Norwood. Dr. Michaels has taken over 1000 hours of advanced education in dentistry for several dental treatments, including implants, cosmetic treatments, and periodontics. To learn more about his practice, contact him at (781) 769-6140 or visit his website.